There is a new coupon up on SmartSource for $1/1 ANY Clean & Clear product that does not exclude trial sizes. 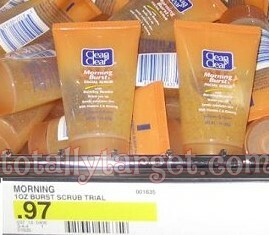 You can pick up the 1 oz trial size of the Clean & Clear Morning Burst Cleanser carried at many Target stores for FREE. You can print twice- however the wording on the coupon limits you to one per person. What zip code is this coupon on? I went to my target about 45min ago and they were sold out. Does anybody know if Walmart carry this size? If Target won’t take my coupons I go to Walmart. Has anyone tried this? Is the coupon beepless? The shelf was already cleared out at my Target…sometimes, I think they do this when they know there is a good coupon out there. “$2 off any Neutrogena Face Product”. Please let me know…thx!!! The cashier at Target wouldn’t take the coupon! She said that I can’t use a coupon on travel size items. BS. The coupon doesn’t exclude travel size. I have never had so much trouble at Target with coupons before. She also wouldn’t take a B1G1 Target glade coupon with $1/1 manufatorer coupon. Deal worked for me in Richmond, TX. Got 2 absolutely free! I believe these are all gone now! I printed two yesterday, but this morning I don’t see them. @Emily: They are still available- SmartSource changes it so you can’t see the coupon after you’ve printed your limit of 2. I printed 2 yesterday on a desktop, but couldn’t see it this morning. Went on my laptop and saw the coupons again, still available for print. I haven’t printed these out, and I don’t see them on my Smartsource…any idea why? No Clean and Clear category on the drop down box even.